Australia captain Ricky Ponting has called on the ICC to make sure the Umpire Decision Review System is used in every series, after the Pakistan board did not put the system in place for the neutral series in England. As the "home" board, the PCB is in charge of such matters, and the UDRS will be used for the upcoming Pakistan-England series. However, it is also not being implemented in the Sri Lanka-India Test series, which prompted the Sri Lanka captain Kumar Sangakkara to express his disappointment. Ponting has also become used to the UDRS and although the on-field umpires had a reasonably good match at Lord's, he would have preferred consistency across series. "I got my point across at the referee's meeting before the series. I think that even the ICC could have stepped in on this occasion," Ponting said. "It's a financial thing at the end of the day, that's the reason we are not using it. I thought the ICC could have come in and done something about it. It hasn't eventuated so we've just got to get on with it now. "You do get used to playing a certain way and having some decisions sent back for a referral. But that's all we've got so we just have to get on with it and let the umpires do their job out in the middle. I think Pakistan just didn't get around to getting it organised quick enough or something. That was the way it was explained to us at the referee's meeting." The cost of the UDRS is one of the major stumbling blocks, and there are also issues around the availability of the equipment. However, given that the system was rolled out properly after a lengthy trial process, Ponting believed the ICC should have stepped in to ensure it was used. 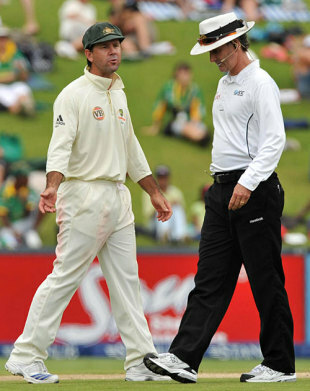 "I don't know the ins and outs of the whole thing and the way it's being run," Ponting said. "In a series like this one which is a neutral one there is always going to be that dispute about who's paying for it and should we use it. It was brought in as compulsory in Test cricket 12 months ago now. I felt if it was ever left up in the air that someone should have stepped in and made sure that it actually happened." Haroon Lorgat, the chief executive of the ICC, defended the current process. Speaking on Test Match Special last week, he said there were several issues that determined whether the UDRS was to be used in the Pakistan-Australia series. "I understood there were some technical difficulties in getting it up and running before the first Test got going," Lorgat said. "The way we fashion the current scenario is for the home team in consultation with the visitors to determine if they want DRS or not. That's part of the process that we're walking to introduce it on a permanent basis."